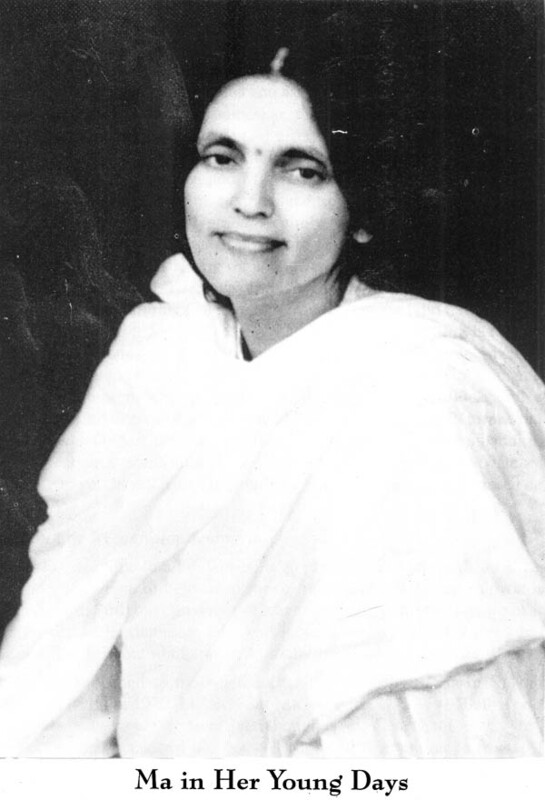 The manifestation of the divine as Shree Shree Ma Anandamayee is unique and unparalleled in the spiritual history of the world. 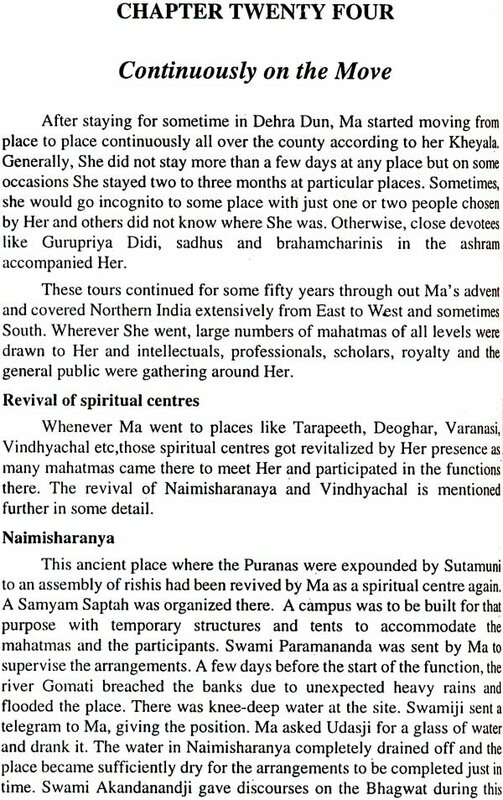 The most exalted spiritual leaders and mahatmas came to Her during Her lifetime and acknowledged Her supreme Divinity. Similarly, great political leaders, royal personages, scholars and people at large from all countries sought Her and received guidance and blessings, from Her. The author, Air Vice Marshal (Retd) P.P. 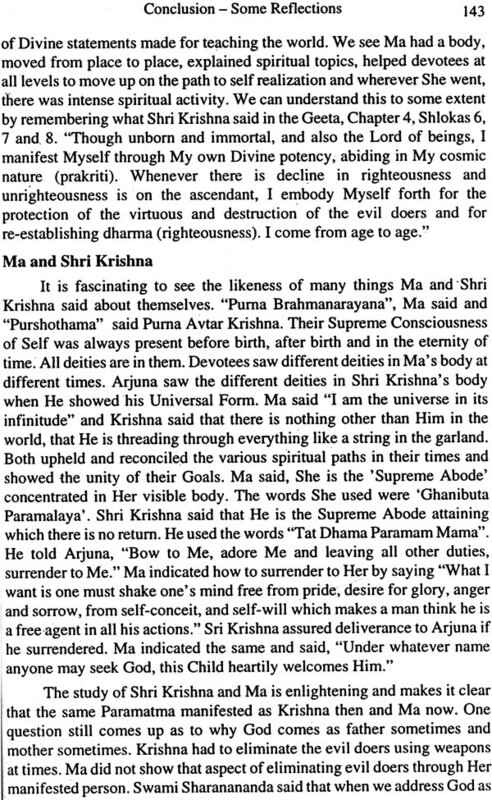 Madhava covers in Part One of the book the way Ma had drawn him and his family in 1967 and showered Her blessing on them through out their life. 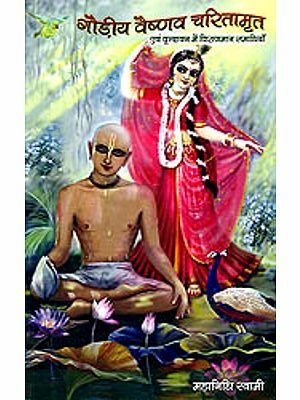 Ma's Leela, the mystic incidents in childhood, marriage, revelation of Her Divinity, the surge of spiritual revival in Her presence, liberation of Many, identity of Her parents family and Her all-inclusive teaching are covered in Part Two. 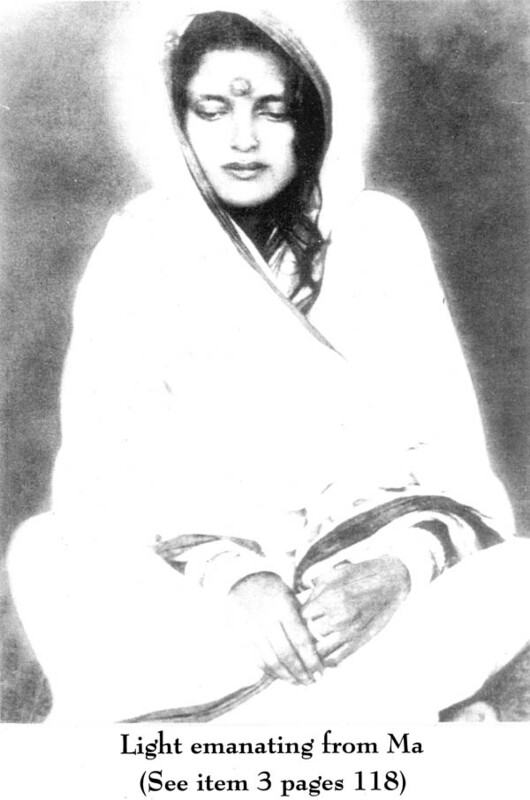 Reading or hearing about the divine Mother, Shre Shre Anandamayee Me, is a joy in itself. 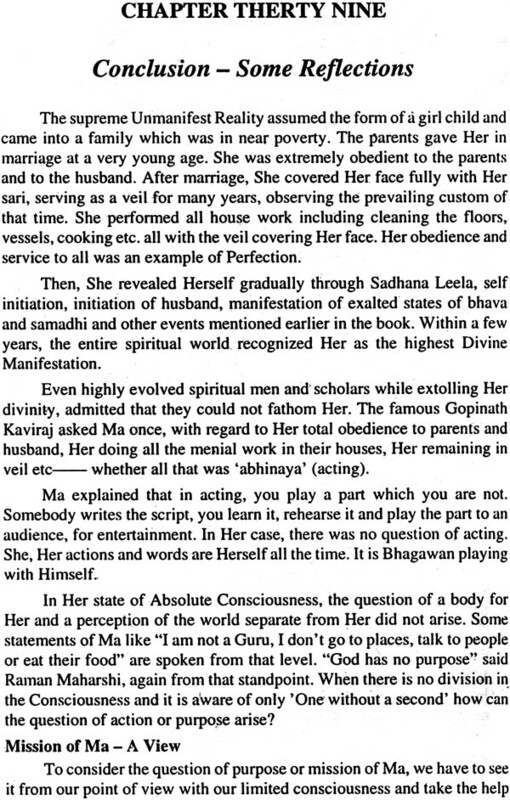 Many devotees and eminent persons have written about their experience of M. Each author brought out some aspects of Ma and her Leela in this world as noticed by them. Sometimes, I wondered whether I should also write about Ma and our experience of Ma' grace. I did not come to any definite conclusion because Ma says a one should concentrate on Sadhana to the best of one's ability. Recently, after attending the morning puja in the Samadhi Mandir of Ma, I was walking back to my room. Shree Somesh Chandra Banerjee, Additional General Secretary of Anandamayee Sangha and Formerly Chief Engineer in Uttar Pradesh and Uttarachal States, overtook me from behind and suggested that I should write about Ma in Telugu. When I told him that my current touch with Telugu was not very good, he asked me to write in English. 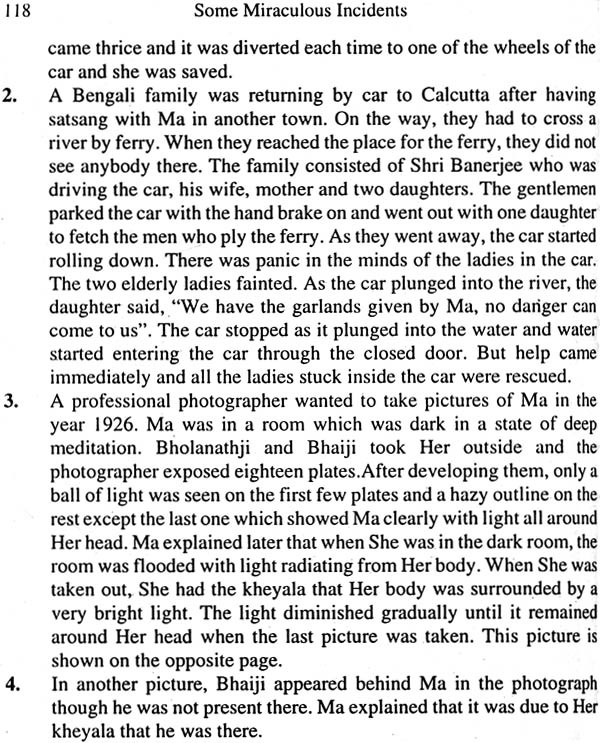 Shri Banerjee is a close disciple of Ma and also closely related to Her having married Sharimati Gayatri Devi, and grand daughter of Didima and niece of Ma. Somehow, the manner and timing of this conversation gave me the feeling that it was prompting form Ma Herself and I decided to make the attempt. I moved to my daughter Vijaya's house in Dehra Dun. Vijaya is principal of Hope town Girls' School, a residential school in Dehra Dun and she lives on the campus of the school. Whenever there was any important work for me, she gave me her full support. In the present case, she gave all the administrative facilities for this work and personally did some computer typing and arranging and centering the titles and the text of the whole book. Her secretary, Shardha Pradhan, helped by doing most of the computer typing and arranging and centering the titles and the text of the whole book before the printout was taken. I wish to record my sincere thanks to Vijaya and Shardha for this immense help. Shir SC Banerjee has seen the draft of the book and gave many useful suggestions, particularly with respect to Ma's immediate family. The book is divided into two parts. Part I gives an account of how Ma has drawn and taken us under Her protective wing and our experiences of Her grace throughout our lives. 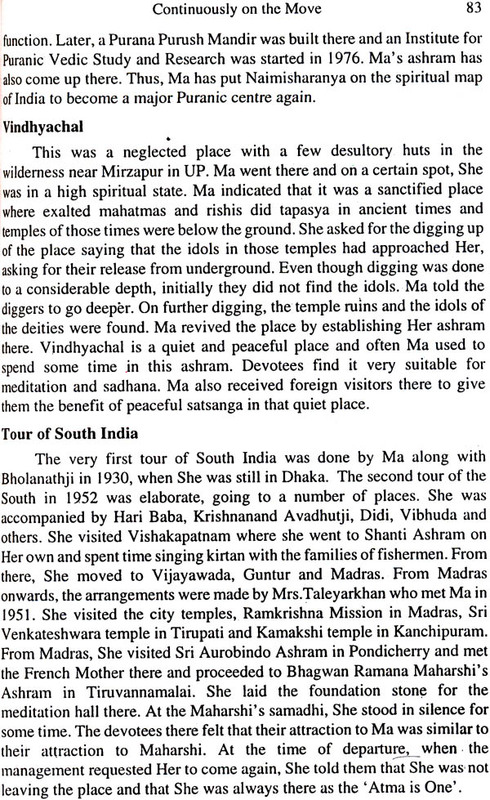 The second part (Part II) is a short account of Ma's advent, Her life, teachings and how She has transformed and revived the spiritual life of people in country and the world. This is rally is a very vast and deep subject. Even many volumes of writing cannot do justice to it. Here an attempt has been made to give the major events in a simple leaders, princes, foreigners, a few names are given as a simple only. Otherwise, the book will become too unwieldy. Similarly, only a few of the miraculous incidents and examples of those who are liberated are given so that the reader can get a more complete understanding of ma. While writing this book, I could feel the guiding hand of Everything I needed, particularly the information I was looking for, presented itself to me with very little effort. The right books, journals, articles came to me as if by themselves. Thus, the search and research for information on Ma has become another experience of Ma's grace. Revered Swami Vijayananda, who is ninety years old and hails from France but remained in India with Ma since 1951 (See Chapter 27) has very kindly written an introduction to this book. My humble pranam to him. This is not meant to be a scholar's work. I is a work of devotion done with the help of Ma and is offered back to Her with humility. Shir Vakas Sharma has very kindly arranged the printing of this book through Shri Rakes Sharma. My sincere thanks to them for the keen interest they have taken in bringing out this book. I hope all the people who have some spiritual urge will be happy to read it and if they are not already on some line of sadhna, will derive some encouragement to take up spiritual endeavour for their own real welfare. I met Madhavaji, the author a/this book thefirst time after I shifted to Kankhal ashram/rom Dhoulchina, Almora, towards 1975. 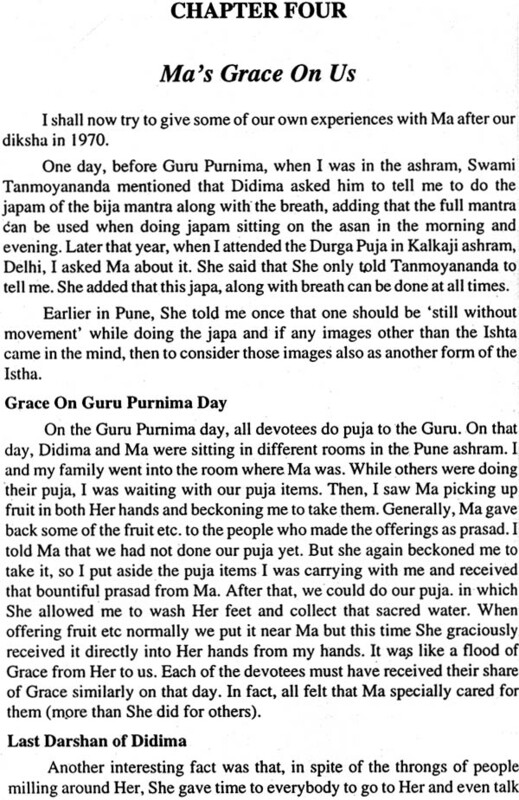 I much appreciated his deep devotion to Ma and his kindness to the members of the ashram. The book is written by a person who although held a very high position in his worldly life (he was Air Vice Marshal) behaves in a humble, kind and dignified way with all the devotees of Ma. This book is a record of the close contact with Ma of one of the closest lay devotees of Ma. weight of book 215 gms.